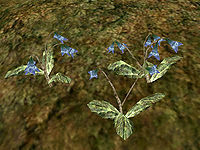 "Stoneflower petals are collected from a small common blue flower of the Ascadian Isles and Azura's Coast." Stoneflower Petals can be commonly found in large numbers in the West Gash, and more sparsely in most other arable land. 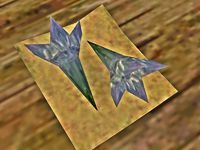 Ajira at the Balmora Mages Guild will ask you to find her a sample during the Four Types of Flowers quest. This page was last modified on 27 January 2017, at 08:53.